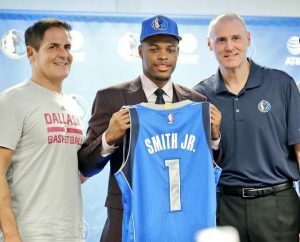 Dallas Mavericks future star, Dennis Smith Jr. seems to have all the right qualities, leading Under Armour to sign the top rookie point guard and No. 9 overall 2017 draft pick to a three-year footwear and apparel endorsement deal worth as much as $2 million per year with incentives. The UA plan is to incorporate him immediately as one of its key featured basketball players right out the gate with a future that looks bright in Dallas, which has Mavs fans, Coach Rick Carlisle and owner Mark Cuban excited. Unlike most incoming rookies this summer, Dennis decided to wait until well after the NBA draft to sign his shoe deal. The majority of the players selected among the top 10 picks — save for Lonzo Ball’s unique Big Baller Brand venture — each signed their endorsement deals during the month of June. During this year’s summer league, Smith average 17.3 points, 4.8 rebounds, 4.2 assists and 2.2 steals per game during the Mavericks’ run in Vegas, landing him on the All-NBA Summer League first team. Many analysts draw comparisons to a young Russell Westbrook and Derrick Rose. If your company is interested in hiring Dennis Smith Jr or other Dallas Mavericks players for an appearance, endorsement or Meet & Greet, contact AthletePromotions.